This topic presents a tutorial exploring how Style tells images what channels to assign to which outputs. Review the Style: Images topic together with this topic. In Manifold, all data is stored in tables. 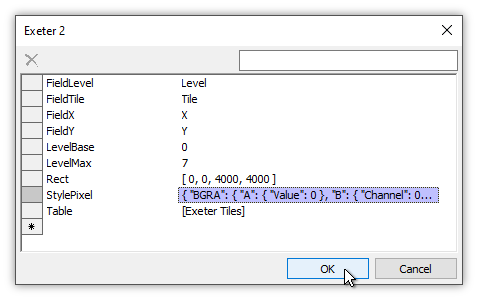 Raster data is stored as tiles in tables, with each record in the table containing one tile. Tiles contain data for some rectangular region of pixels, typically a square region that is 128 pixels wide by 128 pixels high, for a total 16,384 pixels. Tables store raster data in tiles because it is more efficient to store data for sixteen thousand pixels at a time in a record than saving it as one pixel per record. The data type within each tile matches the number of channels and the numeric type that is used by the data set for each pixel. For example, a simple RGB image that uses three channels for each pixel, with a value of 0 to 255 for each channel, might use a numeric type of uint8, an unsigned 8 bit number, for each channel, and thus a data type of uint8x3, a triplet of uint8 numbers, for each pixel. A data set that used more precise measurements of color values for each channel might use uint16x3, that is, a triplet of uint16 numbers, for each pixel. uint8 provides color levels from 0 to 255 for R, G and B channels, which is plenty for most applications, while uint16 provides color levels from 0 to 65,535 for each channel, a much greater level of precision sometimes required for scientific and other remote sensing applications. 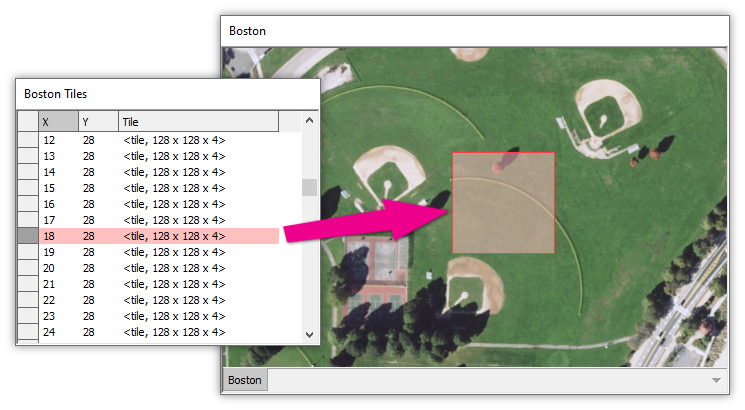 An image is just a viewport that shows data from tiles within a table. The image itself contains no data. 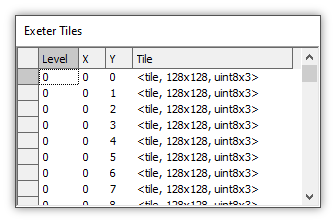 The image contains only a few properties that tell the image what table to use for tile data and how to display that data. For example, the image's properties may say to take data from a table called Airport Table, using a field called Tile, and to use the first uint16 number in the uint16x3 triplet for the R channel, the second uint16 number in the triplet for the G channel and the third uint16 number in the triplet for the B channel. To see the properties of an image, we right-click on the image in the Project pane and choose Properties. The StylePixel property of the image is a human-readable, JSON text string that tells the image how to display the data found in the table. We can change how an image window displays data from a table by changing the "instructions" in the JSON string in the StylePixel property. Changing the instructions in the JSON string doesn't change the data in the table: it only changes what the Image window does with that data. Consider an image of the town of Exeter, in the United Kingdom. We see the image above, zoomed in to native resolution so only a small part of the image is visible. 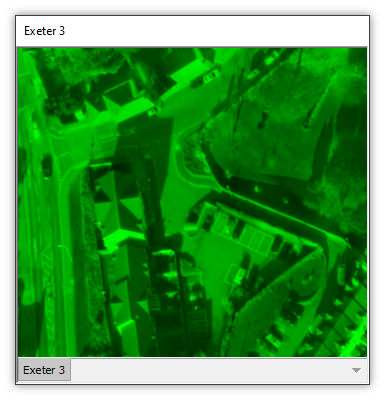 To see the properties for the image, we right-click on the Exeter image in the Project pane and we choose Properties in the context menu. The properties dialog shows the Exeter image takes data from the Exeter Tiles table, from a field in that table called Tile. The StylePixel property tells us that the image uses a fixed Value of 0 for the A or Alpha output, and, from what we can see above, it uses Channel 0 for the B or Blue output. The nine properties we see define the image. Other than the handful of bytes required to specify those nine properties, the image requires no space at all. All of the data is in the table. If we open the Exeter Tiles table we see each record contains a tile that is 128 pixels by 128 pixels in size, with a uint8x3 triplet of unsigned, eight-bit integers for each pixel. With the focus on the opened Exeter image window, we can click into the Style panel in the Contents pane. The Style panel shows a typical arrangement for an RGB image that uses three channels of data. The table uses a uint8x3 triplet of unsigned, eight-bit integers for each pixel, providing three channels where the numeric value of each channel is a number from 0 to 255 (an unsigned, eight-bit integer can only represent integer values from 0 to 255). There is no fourth channel so Manifold automatically assigns a fixed Value of 0 to the Alpha channel, meaning no transparency. To see how the above arrangement that is displayed in the Style panel is written in the StylePixel property for the image, we can open the Properties panel for the image and right-click onto the value for the StylePixel property, choosing Edit in the context menu. That opens the entire value in an editing dialog, so we can see the entire text. We can compare that to the entries in the Style panel to see how the JSON string records what is shown in the Style panel. The StylePixel property says the image should use a fixed Value of 0 for the A output. It also says the image should use Channel 0 for the B output with a minimum value of 0 and a maximum value of 255. If we change settings in the Style panel, that simply changes the instructions written into the JSON string in the StylePixel property for the image. For example, we can double-click into the channel settings in the Style pane to change the assignments of channels to outputs. Instead of assigning Channels 2, 1, and 0 to outputs R, G, and B as the original arrangement had it, we can change the assignments so that Channels 1, 0, and 2 are assigned to outputs R, G and B respectfully, as seen in the illustration above. The result is a "false color" image, where the numbers in Channel 2 that were supposed to be powering the Red output are now powering the Blue output, the Channel 0 numbers that were supposed to be powering the Blue output are now being fed to the Green output, and the Channel 1 numbers that were supposed to be powering the Green output are now being sent to the Red output. The numbers in the uint8x3 triplets within the tiles stored in the table are the same as they always have been. They have not changed at all. They are simply being sent to different outputs when the image displays those tiles. 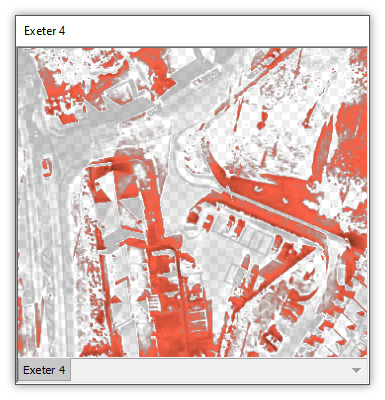 We can open the properties for the Exeter image and take a look at how the StylePixel property value has changed. From what we can see of the StylePixel property, it has indeed changed the JSON text so that Channel 2 is being used for the B output. The alteration in the instructions in the JSON string are changing the "recipe" used by the image window to know how to use the various Channel "ingredients" to create the display. As we can see from the above, the image component takes no storage space at all, just a handful of bytes to store the properties that tell the image what to display and how to display it. When we Copy an image and then Paste that image to make a copy of the image, the copy is simply a copy of the image properties attached to a new image container. 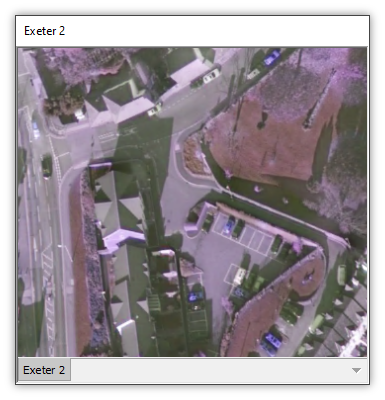 Suppose in the Project pane we click on the Exeter image, we press Ctrl-C to Copy the image, and then we press Ctrl-V to Paste the image, to make a copy called Exeter 2. We open the new Exeter 2 image, as seen above, and we see that it is, indeed, an exact copy of the Exeter image, complete with the weird, "false color" assignment of channels to RGB outputs. In the Project pane we can right-click on the Exeter 2 image and choose Properties to see the properties dialog for the image. 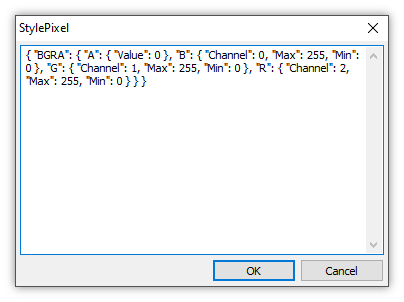 We see that the StylePixel property value is the same JSON string that was in the Exeter image's StylePixel property, where instead of the original use of Channel 0 for the B output it uses Channel 2 for the B output. If we like, we can change the JSON string so that it tells the image to use the original assignment of channels to outputs. The JSON string is nothing but plain, ordinary text, so we can Copy it from a browser, from a text file opened in Notepad, from a cell in a table somewhere or from any other text source. Just like any other text, once we Copy it to the Windows clipboard we can then Paste it wherever we want. 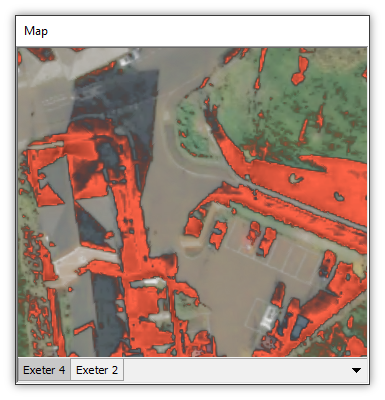 For example, we can right-click onto the value cell for the StylePixel property of the Exeter 2 image and choose Paste, to paste that string into that cell. We press OK and that applies the change to the image. The Exeter 2 image now uses the original JSON instructions to know how to use the numbers it finds in Channels 2, 1, and 0: It uses those numbers to drive the R, G and B outputs, respectively. That is what the original creators of the image intended, so the colors in the image appear, as intended, in natural, realistic colors. 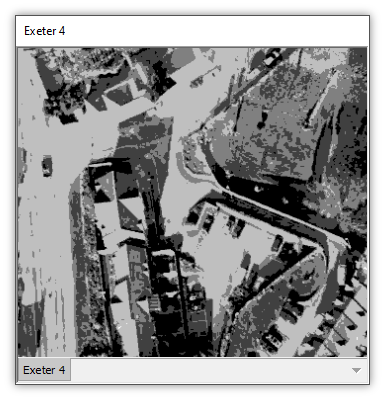 In the Project pane we Copy the Exeter 2 image and then Paste, to create an Exeter 3 image. As expected, the Exeter 3 image is an exact copy of the Exeter 2 image. 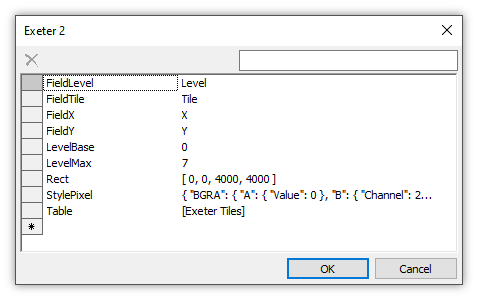 It uses the same tiles from the same table, displaying those tiles using exactly the same Style instructions as the Exeter 2 image. We can change the Style instructions used by the Exeter 3 image to send a fixed Value of 0 to the R, B and A outputs and to power the G output using numbers from Channel 1. 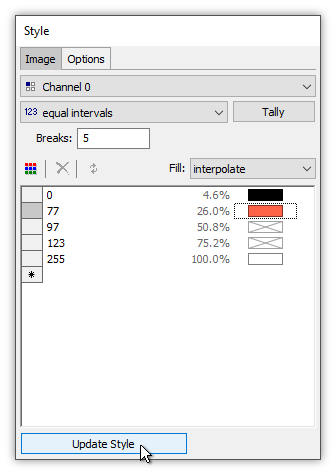 Using a fixed value of 0 to power the Red and Blue channels means to turn those channels completely off, showing the image as if it only had a single Green channel. We Copy the Exeter 2 image and Paste it again, to create an Exeter 4 image. For this image, we will use significantly different Style instructions. 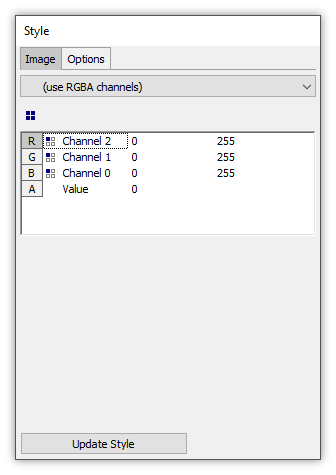 Instead of powering each R, G, B, and A output by either numbers from a channel or a fixed value, we will power them using a palette where the numbers in Channel 1 are used as a look-up index into color values assigned by intervals. We use 5 interval Breaks and a method of equal count, using interpolate to fill colors from interval grayscale colors that range from black to white. The result is what appears to be a grayscale image. 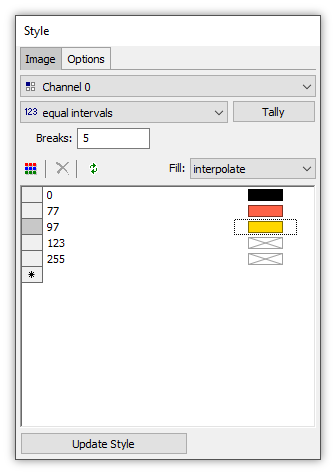 The Red, Green, and Blue outputs are being powered by triplets of numbers specified by the palette, computed on the fly using an interpolation between the five colors specified in the intervals. When the same number appears for Red, Green, and Blue the result is a shade of gray, from black to white. Instead of using interpolate we can change the Fill method to closest lower value. Press Update Style. That "quantizes" colors assigned to pixels so only colors from the four lower value intervals are used, resulting in a posterized effect. We change the colors so the second interval is a shade of orange and two of the intervals use transparent color. We also go back to using interpolate. Press Update Style. In the above illustration we have used the Layers panel to turn off the white, background of the image, so that wherever there are transparent pixels we can see the checkerboard pattern background that indicates transparency. Note how not only do colors interpolate into each other but also how colors interpolate with transparency to form regions of partial transparency. We can create a map and drag and drop the Exeter 4 image and the Exeter 2 image into the map. This shows the tremendous power of the idea that an image does not itself contain data but simply displays data using whatever Style instructions it is told to use. The map shows two images, both of which display pixels from exactly the same tiles in the same table, but the two images display those pixels very differently. The lower, Exeter 2 image shows the pixels in natural color. The upper, Exeter 4 image shows the pixels either not at all in regions where they are fully transparent or in palette colors, or in a blend between fully transparent pixels and partially-transparent colored pixels. Taking a look at the Project pane we see there is only one table with data in it. All four images display the same data from the same table, as does the map, which has two of the images as layers. We could create one hundred images and maps based on the same Exeter Tiles table, each of which showed a different display using different Style, and not increase the stored size of the project at all. "RGB" or "BGR"? - The universal slang for RGB images is, of course, "RGB images." That slang refers to the use of Red, Green and Blue display outputs and does not arise from the literal order of data in the triplets of numbers that specify red data, green data and blue data. Most users working with RGB images in graphics arts editing do not know and do not care what order channels come in, but when we are extracting data or mixing channels for multichannel remote-sensed images we must care about such technical details. Almost always the order of data in a triplet of image data numbers for a pixel is that blue comes first, green second and red third. From a data perspective, the channel ordering is almost always BGR but such images nonetheless are referred to as "RGB" images.